Basic Wire and Cable is an established electrical wire and cable manufacturer and distributor. 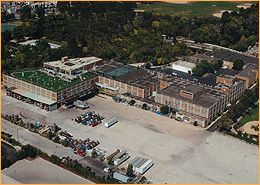 We service our customers from a 500,000 sq/ft modern manufacturing and distribution facility located in Chicago, Illinois. The facility’s size allows us to inventory a vast selection of electrical cable and wire for the transmission of power, sound, and image. In addition, we operate a fully functional manufacturing facility capable of producing standard and custom cable configurations as well as value added products.The unique combination of manufacturing and distributing provide Basic Wire and Cable a competitive advantage when solving our customers wire and cable needs. Since 1954, Basic Wire and Cable has provided an opportunity for companies to select from inventoried material readily available for same day shipment anywhere in the country, or a custom product manufactured to meet your specific needs. Our staff is comprised of industry veterans and experts whose knowledge and attentiveness have built Trust and Loyalty with our customers. These qualities have enabled Basic Wire and Cable to engage in long term customer relationships and friendships. Our staff would appreciate the opportunity to support you with your next electrical wire and cable requirement. Basic Wire and Cable is able to provide customers a large selection of in-stock product, as well standard and custom configurations, manufactured in accordance with industry standards and customer specifications. Basic Wire and Cable provides high quality product, low order minimums world class lead times all at a competitive price! Basic Wire and Cable is committed to providing the highest quality products for our customers. To ensure this, We follow our certified ISO 9001:2008 quality system. Our quality processes insures product consistency through established standards and empowerment of our employees. Each day we strive to reduce waste and enhance our product quality for the betterment of our customer. Our goal is to provide YOU with quality manufactured product each and every time. In addition to complying with standards set forth by National Electrical Manufactures Association (NEMA) and Insulated Cable Engineers Association (ICEA), we hold certifications from Underwriters Laboratories (UL) and International Organization of Standardization (ISO). As our markets mature additional certifications will be obtained. To view our certifications please click on the links below. Basic Wire and Cable provides solutions to meet customer requirements. Our customers find confidence in our commitment to high quality product, low order minimums, world class lead times and competitive pricing. We strive for 100% customer satisfaction and look forward to exceeding your demands.